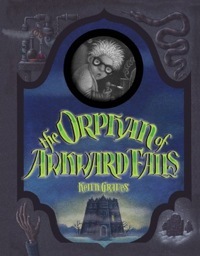 Josephine is sure she’ll be bored when her parents move her to the tiny town of Awkward Falls, Manitoba, but that’s before she discovers her next-door neighbors: kid genius Thaddeus Hibble, his robot butler, and a zombie cat. But the deranged killer Fetid Stenchley, who killed Thaddeus’s grandfather, has escaped the insane asylum and is on his way to take out Thaddeus as well. Throw in an aging movie star, half a dozen enormous genetic monsters, and some dark secrets about the past, and Awkward Falls is turning out to be not so boring after all. Princess Emeralda is clumsy and awkward. She doesn’t fit her mother’s idea of a princess (and she hates her mother’s idea of a proper prince for her to marry), and she’s also no good at the magic her aunt Grasssina, a powerful witch, has been trying to teach her. When it gets to be too much, Emeralda takes off and does something impulsive—she kisses the talking frog who says he’s really a prince. And he isn’t lying…but instead of freeing him from his enchantment, she’s turned into a frog, too. Now Emeralda and Eadric have to try and track down the witch who cast the spell in the first place if they ever want to be human again.